Learn more of the fundamental skills used in making handcrafted furniture. Learn more of the skills and traditional woodworking techniques used in making handcrafted furniture, in this companion course to Fundamentals of Furniture Making. Students will develop their woodworking skills, and will gain further experience using both hand tools and woodworking machinery, while making a hanging tool rack for hand tools. 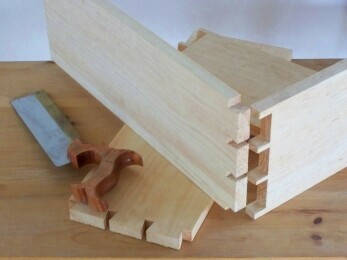 Topics covered include, working with hand tools, cutting and fitting dovetail and mortise-and-tenon joints, as well as other traditional joinery techniques including: stopped dado, rabbet and shiplap joints. All tools and materials provided. Fundamentals of Furniture Making or equivalent experience recommended.